Novak, Barbara. "Calgary Philharmonic Orchestra". The Canadian Encyclopedia, 04 March 2015, Historica Canada. https://www.thecanadianencyclopedia.ca/en/article/calgary-philharmonic-orchestra. Accessed 20 April 2019. The following year (1985) the orchestra moved to its new home: the Jack Singer Concert Hall at the EPCOR CENTRE FOR PERFORMING ARTS. Under Bernardi's direction, the CPO toured eastern Canada in 1989. The Calgary Philharmonic Orchestra was formed in 1955 with the amalgamation of 2 existing groups: the Alberta Philharmonic and the Calgary Symphony. This coincided with the building of the Jubilee Auditorium, which opened in 1957 as the home for the new orchestra. Henry Plukker, who had formed the Alberta Philharmonic in 1955, became the first director of the CPO. In 1963 Haymo Taueber became the orchestra's music director, and that year he formed the Calgary Philharmonic Chorus. Jose Iturbi became music director of the CPO in 1968; when personal tragedy prevented him from returning, guest conductors were featured during the 1969-70 season. Maurice Handford became music director in 1970 and continued in that position until 1975, when Franz-Paul Decker assumed the role of artistic advisor and principal conductor. In 1977 Arpad Joo was named music director, a position he held until 1984, when Mario BERNARDI took over. 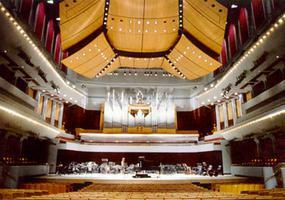 The following year (1985) the orchestra moved to its new home: the Jack Singer Concert Hall at the EPCOR CENTRE FOR PERFORMING ARTS. Under Bernardi's direction, the CPO toured eastern Canada in 1989. In 1992 it embarked on its first international tour, which included performances at Carnegie Hall in New York, Symphony Hall in Boston, the Kennedy Center in Washington, DC, Roy Thomson Hall in Toronto, the NATIONAL ARTS CENTRE in Ottawa and PLACE DES ARTS in Montréal. Mario Bernardi became conductor laureate in 1993. That year Leonard Stone was appointed the orchestra's executive director. Victor Sawa was appointed resident conductor beginning with the 1994-95 season, and Hans Graf was appointed music director and principal conductor of the CPO at the beginning of the 1995-96 season; his contract was recently extended to continue through the 2002-03 season. The CPO performs to over 100 000 people each season in Calgary and is also the orchestra for the Calgary Opera and ALBERTA BALLET COMPANY. It has the distinction of having recorded more with CBC Records than has any other orchestra, with the exception of the CBC's own orchestra. The orchestra embarked on another European tour during its 2000/2001 season.